Earlier this year, I planned a girls getaway to Kerrville, Texas...have you heard of it? Those from Texas may be familiar with this cute little town out in what we call Texas Hill Country. It was a breath of fresh air to get out of the hustle and bustle of the city and enjoy some fresh air, change of scenery and Texas traditions. Texas traditions you ask? It's called TexMex. No matter where you go in Texas there is some form of Mexican food whether authentic or a bit untraditional you can always be guaranteed some chips and dip (queso, guac and salsa), something spicy (think jalapeño poppers) and a margarita. Tip number 1 - ALWAYS include Texas. Have you ever met a Texan? Of course you have because they will make it very clear that is where they are from. Texas pride is a HUGE thing and I sure do have the bug. I love these untraditional straws especially with my hometown state on display. I figured the best way for it to be seen was to stick it in the middle of our Viridian Design floral arrangements. Tip Number 2....aaannnddd the Texas theme continues. Of course we have tortilla chips that are Texas shape. What other state you know that has these? I love that HEB keeps these bad boys in stock. I personally am a fan of mini dishes - I love the mini martini cups filled with guacamole. It's about presentation and keeps your precious guac separate from the other delicious food you will pile on your plate. Sometimes you just want a mouth full of spicy guac with no disturbance - hence the mini glasses. What's guacamole without it's special sidekick....queso! Yes-o! That was the worst stretch of a joke possible but just keep rolling with me, I promise this skillet queso dip won't disappoint! Prepare for addiction with the following recipe...you're welcome. 1. Sautee ground beef with onions and seasonings. Allow it to cook thoroughly. It's okay if the "fat and juices" don't leave the pan, I use it for base. 2. While the meat sautés, microwave the cheese block in which it becomes a liquid. 3. Allow this mixture to stay warm and begin to stir and mix in the queso into the leftover seasonings pan. 4. Next add in the ground beef mixture and begin to fold over the cheese mixture. 5. Open your can of Rotel (drain first) and pour into the cheesy meaty mixture. 6. Once queso is thoroughly mixed, pour into a mini skillet and bake at 350 degrees for 10-15 minutes or until the top starts to brown and bubble. Looking for some margarita tips...check out this MARGARITA POST HERE. February is the month of love at least that's what all big box stores will tell you. We couldn't even get out of New Years long enough before all the pink, red and white hearts were hanging on shelves. Don't get me wrong...I love love and I love Valentine's Day but I wanted to go a more untraditional route with this love thing. So much of Valentine's Day is geared towards "couple" love...but what about the unconditional love that Christ has for us? We all have our different love languages and show how we love in our own way but imagine love across boundaries...countries....continents. In popped the idea of "Love around the world". I tried to make a play on the grazing boards that are so popular and opted for a "dessert grazing board". When you think of Valentine's Day, you think sweets, sugar and chocolate so what better way to showcase to your "sweet"ies (get it?) than with a dessert board? I used a brushed gold baking sheet platter and began to layer desserts of different colorings and textures. I began to make rows of sweets and filled in the gaps with fresh raspberries. One of my favorite Valentine's Day memories happens to be when my Dad would always surprise me with a Teddy Bear, heart balloon and mini heart chocolates. It was tradition for me to wake up on Valentine's Day and still be surprised and touched, even in my older age, of the sweet thought of the bear, balloon and chocolate. Now I knew that this one day doesn't determine if I'm loved but it was sure nice to celebrate this holiday with our Daddy Daughter traditions. Call me a hopeless romantic with wanting to continue fun traditions like this every year. How are you spending your Valentine's Day? I'd love to know! Hi Friends! It's been a while and the seasons have changed (thank God!) and I'm so ready for the cooler months...or the slightly less humid months if you're in Texas. Growing up, I didn't care too much about all the "hoopla" about fall but as I get older, it is definitely starting to grow on me. The cozy textures and colors, savory & sweet menus....wardrobe change (hey knee high boots), I am all for it. One of my favorite things to plan for is kicking off the seasons changing with a seasonal tablescape. 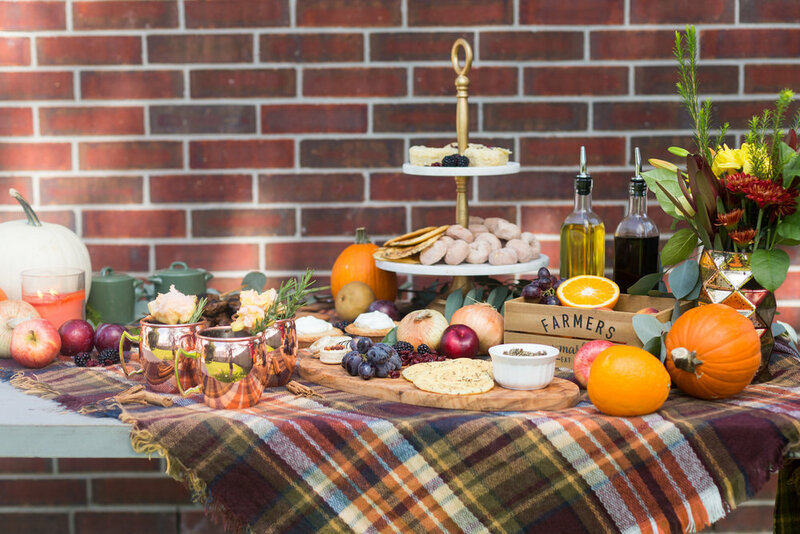 I've always been a fan and doer of grazing tables (more about that coming soon) and figured a fall grazing table would be the perfect and non fussy way to transition & celebrate the cooler temperatures. Knowing that I wanted to capture this mini event, I recruited my friend and fellow hostess, Stacy with Hurried Hostess to join and luckily for me, she's always in. Another sweet element was Mariah with Heritage Macarons that added the feminine & delicate factor to our mini boards with her stunning macarons. Oh and yes, those are mini roses on the macs...I'd go crosseyed even attempting to create something that delicate and small. They are just as beautiful as they look! Here are a few style tips, suggestions...what my teacher friends would say, "use it or lose it" on how to bring in the fall season. One of the keys to being a great hostess is incorporating all the senses...one of my favorites being smell. Whether it is the scent of a pumpkin spice candle or the buttery garlic fumes wafting in the air from plated food, tease your guests with scent. They will begin to enjoy the feast and relax even before grabbing a drink or taking a bite. Speaking of bites...what's a party without delicious food? From the sweet to the savory, a great mix is required. One of my favorite appetizers is the Brie Pastry...who else loves baked brie cheese, mixed berry preserve, and buttery flaky pastry. We can't be friends if you don't find this delicious. Use this simple recipe next time you are in a time crunch and need something quick and delicious to serve. Bake cups for 12-15 minutes or until fully cooked (should mimic the look of a cylinder) or golden brown. While still cooling, place a "dollop" of your preserve in the base of each pastry cup. Slice cubes of your Double Cremé Brie Cheese and allow it to sit on top of the preserve base in the pastry cup. *Optional - Once complete, placing the cups back into a warm oven to allow the cheese and preserve to melt and mix is priceless! After allowing both the preserve and cheese to "marinate" together, I topped with dried cranberries. Any fresh fruit to match your preserve base will do. I promise you this will be a hit and all gone before you know it...you're welcome but don't blame me for your addiction. Another noteworthy party element are the sips. I love a good, fruity, over the top cocktail and my love of bubbles in my beverage has no limit. Try the recipe for the Sparkling Cider Spritz below. Can be created as a cocktail and mocktail to fit any occasion but perfect as a signature drink for a fall wedding, adult pumpkin patch party, tailgating event..or anything fall related. *Optional* Trade out the Sparkling Cider for La Marca Prosecco & add 1/2 cup of Disaronno and remove the sweet tea. Instructions: Mix all liquid ingredients (apply correct substitutes if making a cocktail or mocktail) in a glass pitcher. Stir until all items are mixed. 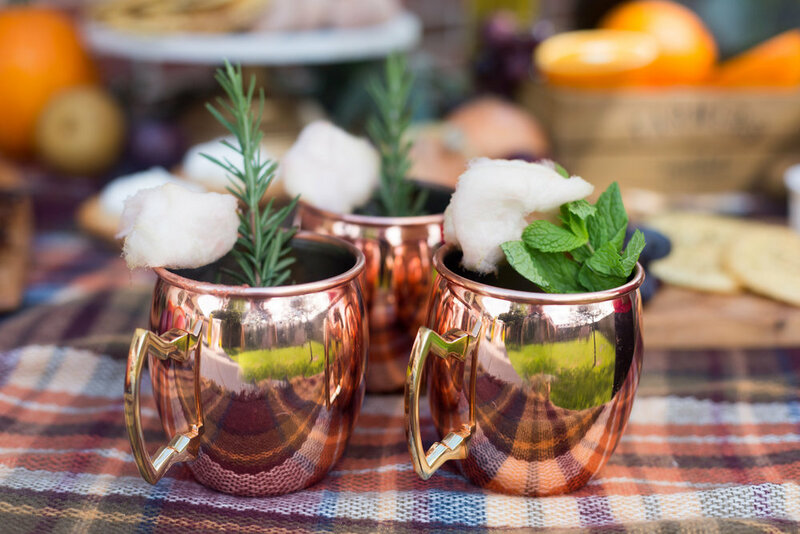 Pour mixture into a fun mule mug, copper jar or mason jar. Garnish with cotton candy and a pinch of cinnamon. Enjoy! I hope you received some helpful inspiration that will encourage you to host your own fall event. The recipes alone will be the talk of the party. In the meantime, let's have some picture over load shall we?